But for real now, equipped with my Nikon D3200, I was able to track down a few different beasts (dogs, goats, and dragons) and make the most of the great natural and artificial lighting at Klyde Warren Park. This past weekend, my coworkers and I joined 100+ people on Trey Ratcliff‘s Photo Walk of Downtown Dallas’ Arts District. Only five minutes from my apartment, I had the opportunity to look at something familiar in a brand new way. Rather than snapping quick photos of events for social media like I do daily, I finally got a chance to slow down, ask questions, figure out the metering settings on my camera and literally follow the footsteps of some great photographers. I felt a little left out without my tripod, since I might have been the only person without one, but overall I wasn’t too upset with my shots. Here’s to many more photo walks! Working in social media can always lead to unexpected assignments landing on your desk. 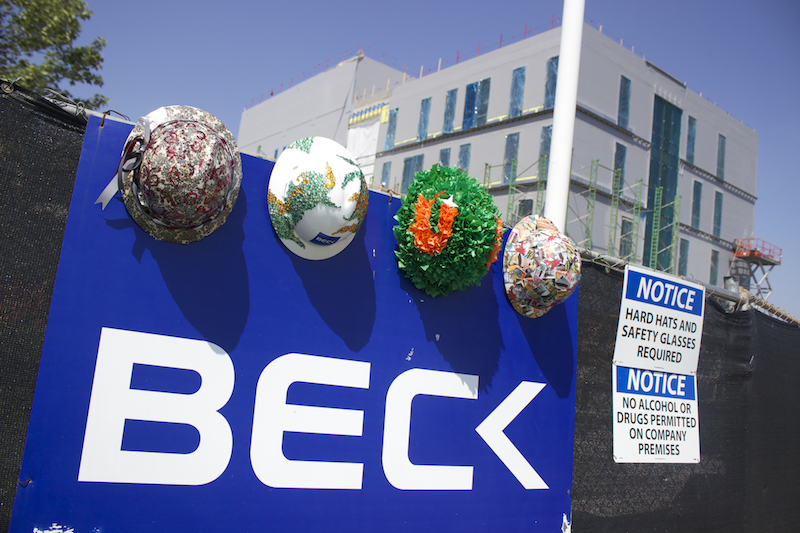 This time someone needed a few hard hats from The Beck Group decorated for an event. I’m not one to pass up random opportunities to be crafty, so I bought my first $12 glue gun from Hobby Lobby and got after it. 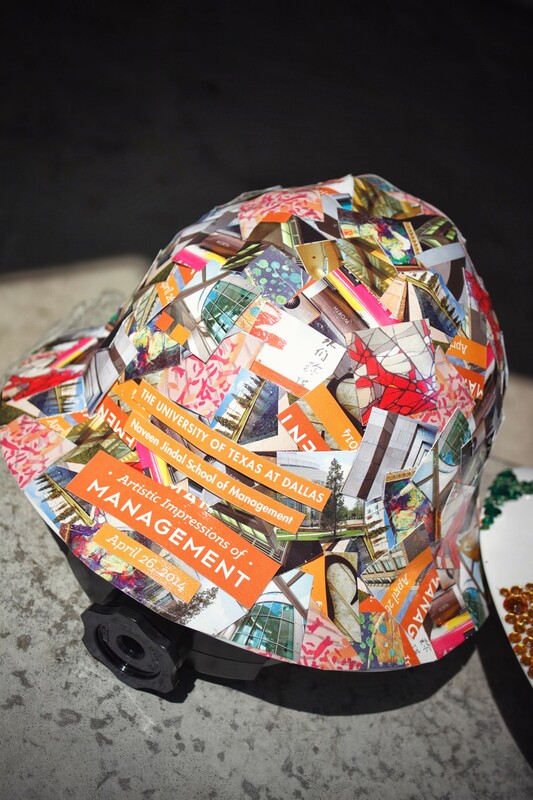 10 hours later, I had two hard hats that I think turned out pretty nice. 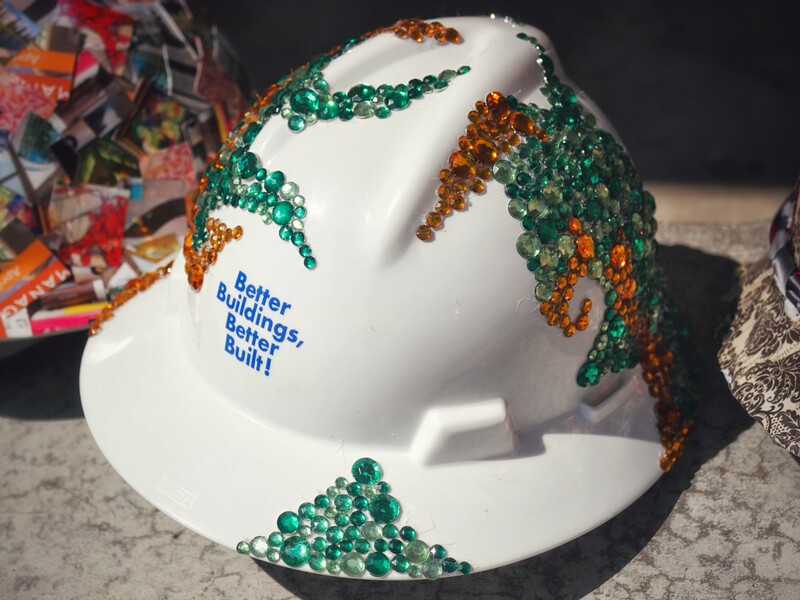 Hats on display at the new addition Beck Group construction site. Don’t buy the $25 glue gun. It might look tempting, but you won’t need it. If you are going to collage anything, use a thicker glossy paper like the extra invites I used. They’ll be able to handle the hot glue and the mod podge won’t make it soggy. Don’t assume that stores sell certain colors of jewels separately. I learned that the hard way and spent hours going cross-eyed picking out orange and green in a sea of colors. Start from one direction when bedazzling the helmet. Trying to meet half way will result in extra spacing. Two years ago I taught myself graphic design. Thanks to my overpriced wifi connection and patient boyfriend, I started down the path of being a somewhat successful designer who majored in Sociology and has a masters in Higher Education (what?). But I made a mistake – I didn’t document my journey. Some might say my biggest mistake was not going to art school when I was 18 (I disagree with that completely). But two years ago, I wish I had really shown the process to others, to convey that learning something new and completely the opposite of your formal education is not an impossible venture. This time I’m not going to miss the opportunity to share. This is me learning ART. Note: It’s not just about learning the technical skills, but how the industry functions, terminology, hacks, trends, history, etc. Follow my day-to-day on on Twitter, Instagram or my go-to resource, Pinterest. My message is that just because you didn’t go to art school, or design school it doesn’t mean you can’t make it in their world. The mind is a powerful thing and I hope to inspire others to start with a goal, learn as much you can (formally or online), and make it happen. It doesn’t matter how old you are, or how new you are to something, but if you work hard you might just be able to cut it in a different or blended world. I’m a little bit behind with covering it – I started the process 8 months ago. I’m also going about things a little bit differently because I decided to take a few classes at the Dallas Creative Arts Center just to get a few of the fundamentals taken care of. It was nice when I was learning graphic design because my tutorials and workspace were online and all I needed was my lap. Now I need a table, a drawing board, brushes, pencils, pens, and an even more patient boyfriend. Disclaimer: The process of learning art or something new can be exceptionally difficult at times, I would never say that it’s easy. You might need some natural ability to draw or be creative, and you need to be a little crazy and fearless. I’m not saying that graphic design isn’t art, because it definitely is.